Well autumn is finally arriving here -- at least we hope we all are done with summer high temperatures. We've received good rains lately and everything is green again. The trees are starting to show a little color on the bluffs, and the fall flowers are in full blooms along the lake. Trout fishing on Taneycomo stayed pretty strong all summer. We usually see water conditions deteriorate as fall approaches -- the dissolved oxygen drops, and water temperature rises -- but we haven't seen hardly any of that yet. The lake temperature is holding at about 52 degrees, and the water is very clear. Generation has varied; weather and temperature seem to dictate how much and how long dam operators run water. Since its grown cooler, they've been running water for two to three hours late in the afternoon and only running one to two units. Our brown trout move up in the lake in fall months to spawn. They actually don't spawn successfully, but do go through the motions. We are seeing a good number of browns already up below the dam, some being caught up near the hatchery outlets. Guide Chuck Gries told me clients are hooking most browns when wading and fly fishing below the dam. Most of these browns are on the small side, but several in the 22 - to 26-inch range have been brought in. Guide Tony Weldele has been seeing some very large browns moving up, staging in the Narrows area. These browns are almost always on the move and won't stay in one area for very long. 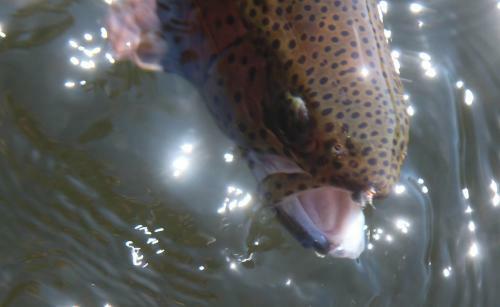 Browns and rainbows are being caught on scuds, sow bugs, egg flies and sculpin streamers. I know other flies are good, too, including cracklebacks, WD40's, san juan worms, mega worms, soft hackles and woolybuggers. Night fishing has been very good throwing big streamers, as well as the miracle fly and scuds under a glowing indicator. Thursday morning I fished the Narrows area with no generation. Since it was almost 9 a.m., the sun was already up over most of the area. Struggling for most of the morning, I tried larger scuds (12's and 14's) in gray and brown with no takers. I stripped a sculpin woolybugger for a while with not even one chaser. It wasn't until I changed to 7x tippet and a #18 gray scud that I started picking up trout. I also tried and caught a few on a #18 primrose -n- pearl zebra midge under a float 30 inches deep. It was sunny with hardly any wind, so conditions were tough. When fishing the bigger flies, the fish would come and look, then turn away. But later when I reduced the size of everything, I was able to target feeding rainbows, especially close to the bank and on the shallow flats. Scud flies come in lots of sizes, shapes and colors. We tie most of them using natural fur of various kinds -- squirrel, rabbit, mink, muskrat, dog and cat . . . even kangaroo! Each one has a different texture and ties differently on a hook. They also act differently in water. The shape depends on the style of hook used, whether long, short, curved or straight. And, of course, the size depends on the size of hook. We add weight using very thin lead wire wrapped around the hook or thin brass or copper wire wrapped around the fur to give the fly a segmented look. Once the fur is applied and the fly is done, a small wire brush is used to comb the fibers down, creating the legs under the bug. Excess fibers are trimmed on top -- although my example scuds aren't combed and trimmed very well. I observed scuds in tan, gray, olive and brown colors while raising them in an aquarium several years ago. In the evenings when water has been running, I have been jig fishing, mostly in the trophy area. Wednesday evening I started up close to the dam, looking up in some slack water pockets for staging brown. I did find a few medium-sized browns in what I would call outlet #4 -- where the water comes out of a pipe about 150 yards below outlet #3. I hooked one of these browns for a few seconds on a chartreuse mega worm under an indicator, but the hook pulled out. I tried a few dry flies in this area because I've had luck in the past picking up both browns and rainbows, but they weren't interested. I moved on down the bank throwing a 1/8th ounce sculpin jig, brown head and caught a few decent rainbows. Skipping the Trophy Run area, I boated on down below Lookout Island. That's where this video starts. I was hoping to luck into one of the browns that our guides had been telling us about. This was a big female. Its adipose fin had been clipped, identifying it as a triploid brown. Triploids are rendered sterile from birth. Eggs from brown trout are treated with hot water just after being fertilized, making them sterile. These browns are thought to grow faster because they supposedly don't go through the motions of spawning like other browns. The Missouri Department of Conservation first stocked triploids in Taneycomo in 2011. They only make up a small percentage of the total number of browns stocked. We've been pretty successful throwing smaller jigs with two-pound line down around the resort area, up closer to Fall Creek but still out of the trophy area. The area from Fall Creek up to the Narrows has also been profitable with sculpin/ginger, sculpin/peach and straight sculpin or olive in 1/32nd -and 1/16th-ounce jigs. Before the sun hits the water, work your jig close to the surface, especially if the trout are midging, and fish them deeper as the sun hits the water. During generation, we're using four-pound line and heavier jigs -- 3/32nd and 1/8th ounce in the same colors. This is a #8 short shanked hook we sell on our drift rigs. Salmon eggs are still doing very well when the water is off, fished from our dock and other locations on the lake. Also Powerbait paste in yellow and orange as well as PowerEggs when drifted with the current.